From March 22 until the 27th, Swiss exhibitors will present their latest models of watches at Baselworld 2018, the annual exhibition that takes place in Switzerland. 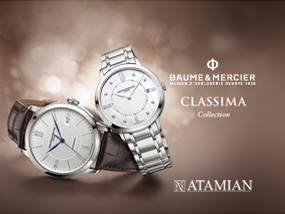 We have selected exceptional watches by famous brands. movement. In homage to the tradition of classic chronographs, Patek Philippe has endowed its timepiece with a pulsometric scale that can measure the rhythms of an active life or the beating of the wearer’s heart. case. The 44 mm case is brushed titanium. peripherally by three ceramic ball bearings, allowing the tourbillon to be admired without obstruction from both front and back. Carl F. Bucherer’s patented peripheral unidirectional rotor allows for a completely open view of the movement through the sapphire caseback. Calibre T3000, with silicon components and a stop-seconds function, is one of the few tourbillon movements on the market to be officially COSC chronometer-rated. 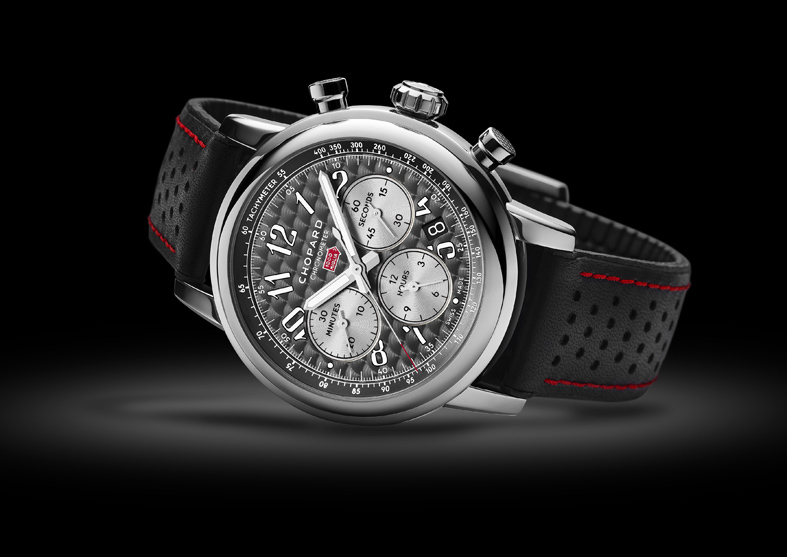 This year CHOPARD celebrates the 30th anniversary of its sponsorship of the Mille Miglia race between Brescia and Rome. 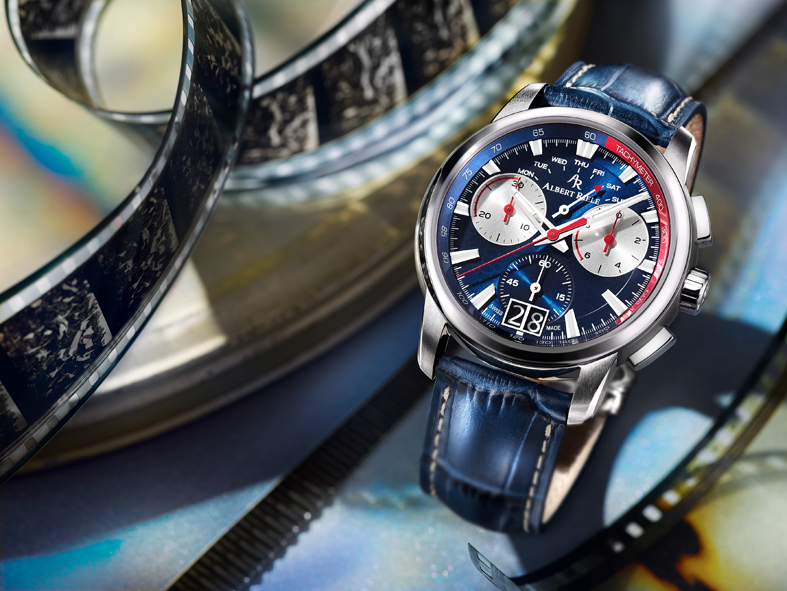 Each year, CHOPARD celebrates the classic car race with a limited-edition sports watch. The Mille Miglia 2018 Race Edition is a numbered series with a COSC-certified movement that has a rate variation within -4 to +6 seconds per day. There will be 1,000 pieces in steel – marking the 1,000 miles of the race – and 100 pieces in 18k gold and steel, each with an inscription on the caseback: “Chopard & Mille Miglia 30 anni di passione.” The watch is designed as a tribute to classic automobiles, with a dashboard-inspired dial, a notched crown resembling a gas-tank cap, and chronograph pushers shaped like engine pistons. The strap is perforated in the style of driving gloves. 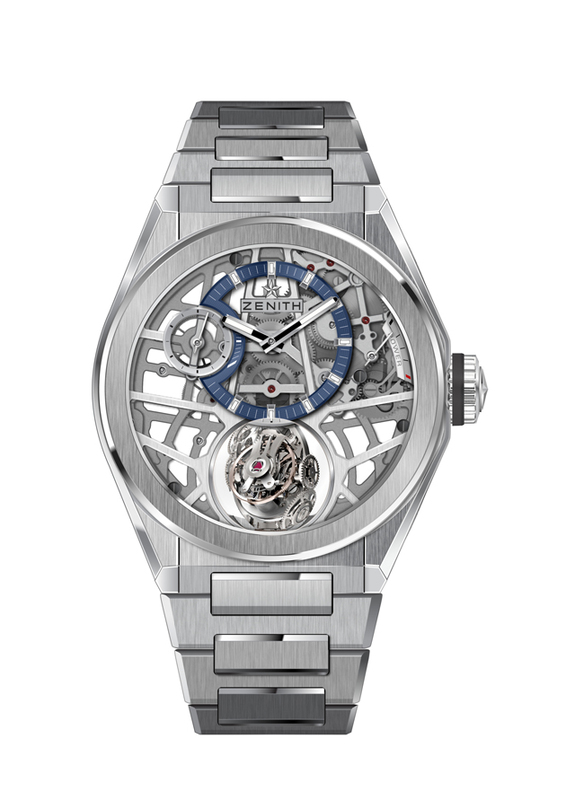 The Hybrid Manufacture combines Swiss-made fine mechanical watchmaking with smartwatch functionality in a single watch. The movement is manufactured and the electronic parts are also in-house developed, produced and assembled. Functions include hours, minutes, seconds and date, as well as smartwatch functions, including activity tracking, sleep monitoring, battery life indicator, worldtimer and dynamic coach. 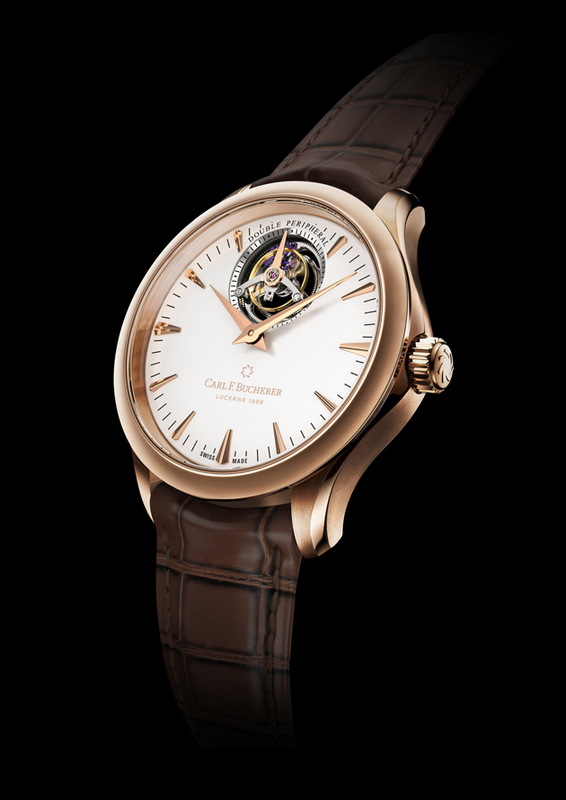 In order to overcome the negative magnetic effects between the two technologies integrated into one case, Frederique Constant developed and patented a unique anti-magnetic shield case within the case. The movement also features something called calibre analytics, which measures the rate, amplitude and beat error of the mechanical calibre. It comes in a box that also serves as a rotator and charger, powering two technologies at once. It can also be charged outside the box with a USB cable. 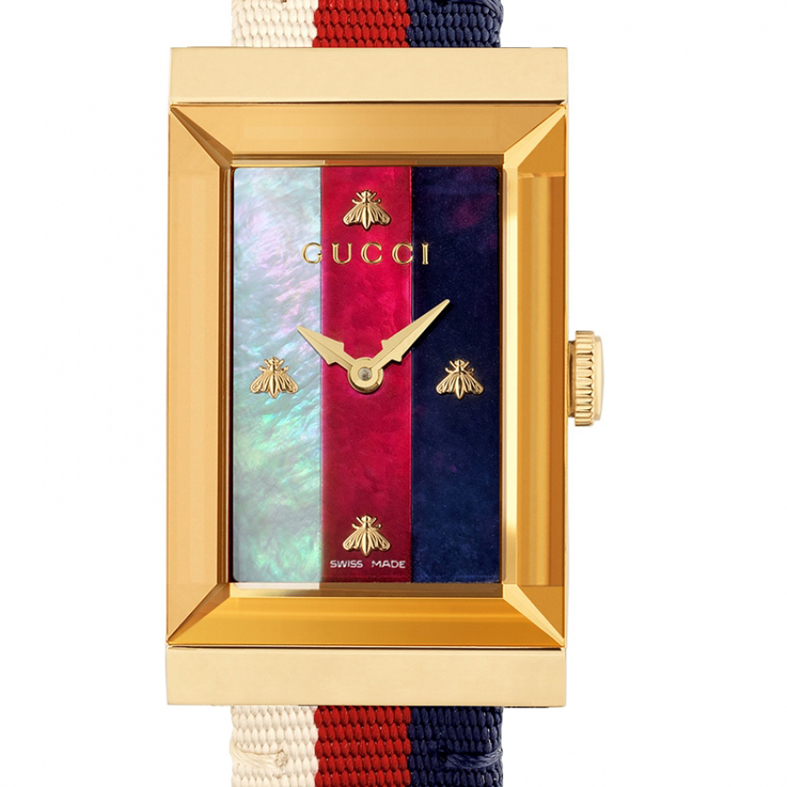 Gucci has extended the G-Frame watch collection with a new size and a variety of styles that combine the House’s design codes with contemporary detailing. Highlights include a range of versatile new sizes with interchangeable straps. Declined in two different finishes, the cases of these watches are enhanced by delicate snakeskin straps, offered in a range of additional colors to match the mother of pearl dials. A yellow gold PVD variant with a cream-red-blue Sylvie House web mother of pearl dial, for example, comes with a textured brown snakeskin strap, which can be exchanged with a palette of alternative snakeskin straps, each finished with a yellow gold PVD ardillon buckle. Steel mesh, web nylon, and patterned straps are also available. Also another 21 x 34 mm model brings together a steel case with a green-red-green mother of pearl dial with signature Gucci bee indexes. resistant, it is ready for any adventure, from water sports to motorcycle racing. The deep blue dial is an ideal backdrop for the contrasting silver chronograph counters, with red hands to make seconds and hour and minute totalizers extra legible. The large double-window date and the superluminescent inlay on the hands and markers are also designed for high readability. A red-tipped hand that sweeps the arched day-of-the-week scale at 12 o’clock is also hard to miss. 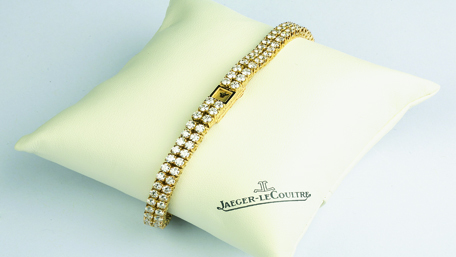 Additional options include an extra bracelet or strap and a personalized case. 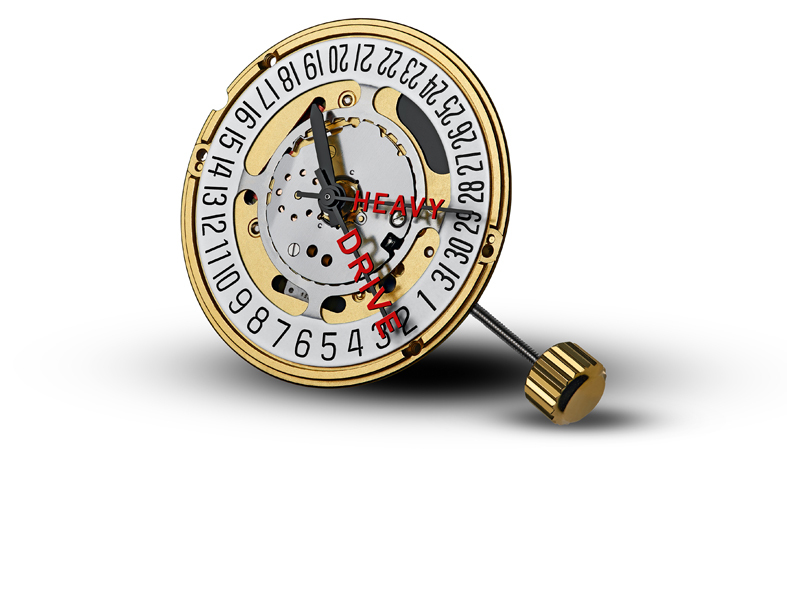 ETA SA, a Swatch Group company, presents HeavyDrive – a new and exclusive technology for use in quartz movements. As its name suggests, this new system will enable movements to tolerate heavier hands than is usually possible. It can detect, but also most importantly manage, the effects of impacts. The system’s integrated circuit prompts the motor to produce an opposing force to counteract the one caused by the impact so as to lock the hands during a jolt, preventing accidental jumps and loss of accuracy. The seconds hand sees a 200% increase in unbalancing mass, while the minutes hand is increased by 20%. HeavyDrive technology can therefore tolerate a significantly higher imbalance than ordinary hands. This integrated circuit reacts in just a few microseconds. It is this rapid response time that makes it possible to preserve the movement’s autonomy. 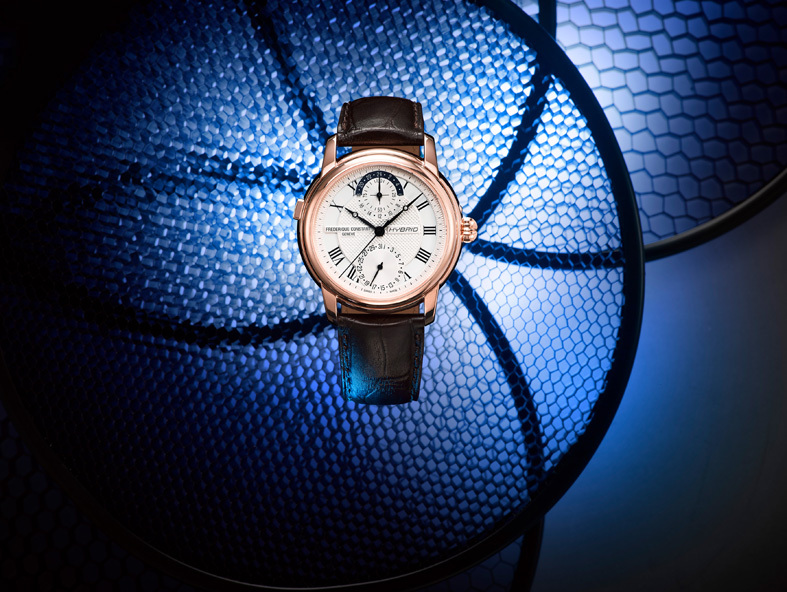 What's New from SIHH 2019? The Champagne Nights Fantasy Bra by Mouawad Lands in Beirut!